Urban air pollution has become a major concern over the past decades. One of the largest conurbations in Sub-Saharan Africa is developed around the cities of Johannesburg and Pretoria (Jhb-Pta megacity). In this study, a photochemical box model with a detailed representation of ozone (O3) formation chemistry was used to investigate the state of current air quality and photochemical processes in the Jhb-Pta megacity, as well as scenarios that could possibly mitigate air pollution. Results indicated that the Jhb-Pta megacity is within a VOC-limited (or NOx-saturated) regime. Major sources of NOx include transport from the Mpumalanga Highveld and local traffic emissions. O3 levels in the Jhb-Pta megacity will be more effectively reduced if VOC (volatile organic compound) emissions are decreased. A reduction of NOx emissions leads to an increase in O3 because of a decrease in titration through the reaction with NO. The same effect was observed in various cities worldwide where O3 levels increased when NOx emissions were reduced during emission control strategies. The effect of reducing vehicular emissions in the Jhb-Pta megacity on the production of O3 was also investigated. A significant increase of approximately 23 ppb O3 was observed when emissions of VOCs, NOx and CO were reduced by changing from Euro-0 to Euro-3 vehicles. It is therefore recommended that VOC emissions are decreased together with the implementation of Euro-3 and cleaner vehicles in the future. One of the largest conurbations in Sub-Saharan Africa is developed around the cities of Johannesburg and Pretoria. This conurbation is one of the 40 largest metropolitan areas in the world with a population of over 10 million. Conurbations of this magnitude have been defined as megacities.1 The Johannesburg-Pretoria (Jhb-Pta) megacity is also the central hub of economic activity in southern Africa. The main pollution sources in the Jhb-Pta megacity have been identified as traffic emissions, biomass and domestic combustion (space heating and cooking), as well as industrial activities.2,3 The major pollutants emitted from these activities include nitrogen oxide (NO), nitrogen dioxide (NO2), sulphur dioxide (SO2), carbon monoxide (CO), particular matter (PM) and various organic compounds. The Jhb-Pta megacity is also located relatively close to large industrialised regions in South Africa, i.e. the Mpumalanga Highveld, approximately 100 km to the west and the Vaal Triangle approximately 50 km to the south. It is therefore likely that air quality in the megacity will be influenced by the proximity of these areas. According to the National Environmental Management Air Quality Act4, it is a requirement to utilise air quality models in decision-making processes and impact studies in South Africa. Implementation of this requirement has thus far mainly focused on applying dispersion modelling and not on improving processes within these models. However, these models are seldom developed and modified for the unique South African conditions, which differ vastly from conditions in America and/or Europe where most of these models were developed. Some of the dispersion models also include very limited chemical mechanisms. 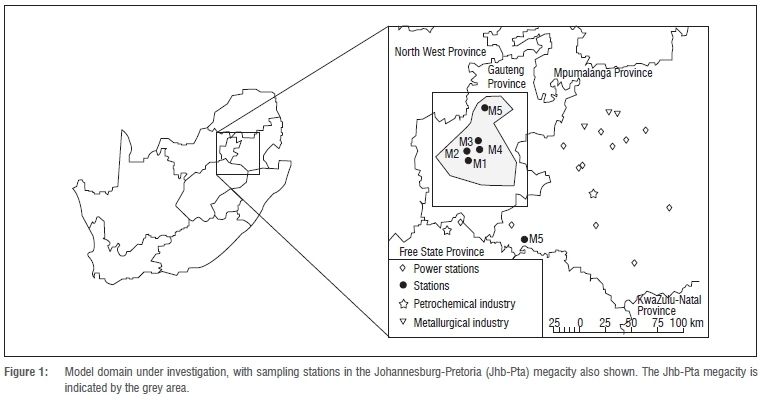 In an effort to investigate the interaction of O3 precursor species and the resulting O3 levels in the Jhb-Pta megacity, as well as to determine the possible contribution of O3 precursor species emissions in areas surrounding the Jhb-Pta megacity, an existing photochemical box model, MECCA (Module Efficiently Calculating the Chemistry of the Atmosphere), was further developed and modified in this investigation. This modified version allowed a better representation of mixing of upwind air masses, and was termed MECCA-MCM-UPWIND. The MECCA-MCM-UPWIND model was used to perform sensitivity studies on the influence of different parameters on O3 levels in the Jhb-Pta megacity. Possible scenarios to alter or mitigate pollution were also investigated. MECCA is a multi-purpose atmospheric chemistry model that contains chemical mechanisms describing tropos-pheric and stratospheric chemistry in both the gaseous and aqueous phases.15 MECCA was originally developed by Sander et al.15 at the Max-Planck Institute for Chemistry in Mainz, Germany. The full Master of Chemical Mechanism (MCM) was added to the MECCA box model and the MECCA-MCM model was used as described by Butler et al.16 The MCM v3.1,17-18 obtained via the website: http://mcm.leeds.ac.uk/MCM, is a near-explicit chemical mechanism that describes the detailed gas-phase chemical processes involved in the atmospheric degradation of a series of primarily emitted volatile organic compounds (VOCs). The existing photochemical box model, MECCA-MCM, was further developed and improved in this study. This model was named MECCA-MCM-UPWIND, which included horizontal and vertical mixing processes, as well as boundary layer height variation. These processes were included to simulate the advection of upwind air masses into the modelling domain, as well as the entrainment from the troposphere through the diurnal mixing layer (ML) height variation, allowing a more detailed simulation of the processes controlling air quality in the Jhb-Pta conurbation. The model domain was selected to be 100 km x 100 km, which included the Jhb-Pta megacity. The model domain is indicated by the rectangular block in the magnified area in Figure 1. Only three of the five measurement stations located within the model domain conducted continuous meteorological measurements during the sampling period, because maintenance was being performed at the other two stations. Meteorological data obtained from these three measurement stations were averaged over a 3-month period (March-May) in 2009 to determine the diurnal variability of meteorological parameters in the Jhb-Pta megacity. According to these data, the average temperature, atmospheric pressure, and relative humidity for autumn (March-May) in the Jhb-Pta megacity ranged from 12-22 °C, 84.3-84.6 kPa and 40-80%, respectively. The mixing ratio input data required were the initial, tropospheric and upwind mixing ratios. The initial and tropospheric mixing ratios were obtained from ground-based measurements and published global model runs. The composition of the upwind mixing ratios, i.e. the air mass advected into the Jhb-Pta megacity, were determined by running the MECCA-MCM-UPWIND model with representative data for the Mpumalanga Highveld. The Air Pollution Model (TAPM) was utilised to simulate surface and free tropospheric meteorological data at a 2.5 km x 2.5 km resolution using synoptic scale meteorology (longitude/latitude grid at 1° grid spacing). The input data for TAPM were obtained from the US National Centre for Atmospheric Research. The average diurnal ML for three months (March-May) for the Jhb-Pta megacity was determined over a five consecutive year period (2004-2009) at a height of 1275 m.
South Africa does not currently have a comprehensive gridded national inventory for sources of atmospheric emissions that are readily available to scientists. This complicated the acquisition of emission data used in the model. Detailed emission data do, however, exist for specific regions. These data sets were mostly obtained through research initiatives (e.g. SAFARI 2000), by metropolitan councils or by private companies on behalf of major industries. An emission inventory was developed for the Mpumalanga Highveld region during the Fund for the Research into Industrial Development Growth and Equity (FRIDGE) campaign in 2004.22 Although this emission inventory was compiled for the Mpumalanga Highveld region, it also contained emission sources for the Jhb-Pta megacity. These emission sources included residential vehicles, industry, residential activities and biomass combustion as indicated in Table 1. Emissions for the species based on the FRIDGE studies were mainly used in this investigation. The FRIDGE emission inventory was also supplemented with the emission inventories developed for the Vaal Triangle during the Vaal Triangle Airshed Pollution Area (VTAPA) study in 201323 and the Gauteng study in 200924, also presented in Table 1. The full MCM chemistry scheme in MECCA-MCM-UPWIND also included numerous non-methane hydrocarbon (NMHC) species. Although some studies have been published reporting BTEX (benzene, toluene, ethyl benzene and xylenes) for very limited sampling areas in South Africa,3,25 no detailed speciated NMHC data existed for South Africa at the time of the study. 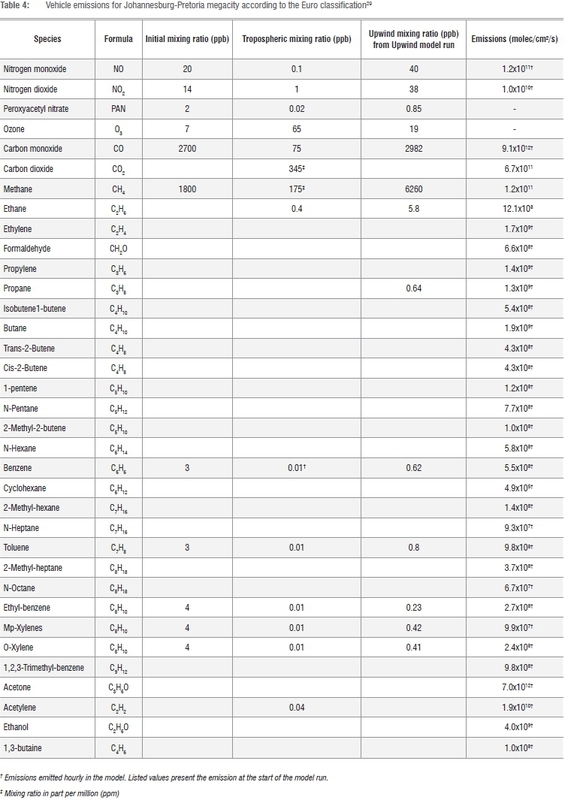 Local inventories included benzene, formaldehyde, acetaldehyde and 1,3 butadiene as indicated in Table 1. 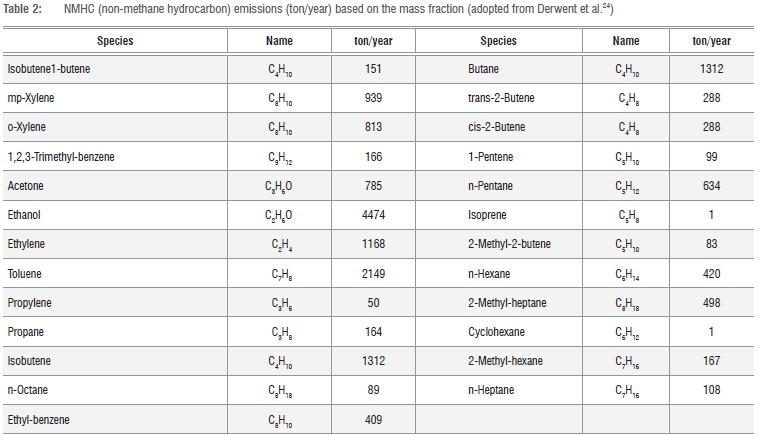 Emission data (emission rates in molec/cm2/s) of NMHC species that were required as input data for the MECCA-MCM-UPWIND model were based on emission mass fractions for European conditions26 and total carbon emissions (t/year) for Gauteng, which are listed in Table 2. As this was based on European conditions, the estimated NMHC emissions could potentially be an under- or over-estimate. In the Jhb-Pta megacity, traffic is regarded as the major emission source, contributing to approximately 80% of the total nitrogen oxide (NOx) emissions.27 Vehicles also account for approximately 60% of benzene, 100% of formaldehyde, 99% of acetaldehyde and 70% of the total NMHC emissions.28 Pollutant species from traffic emissions have a significant diurnal variability. Goyns29 determined the real-world fuel consumption and emissions from passenger vehicles for Johannesburg from 2001 to 2005. According to Goyns29, most of the vehicular emissions are emitted during the peak traffic hour periods 06:00-09:00 and 16:00-18:30. The above-mentioned diurnal variability is in general agreement with Menut et al.30 (Schaberg. 2012. Written communication April 23),. 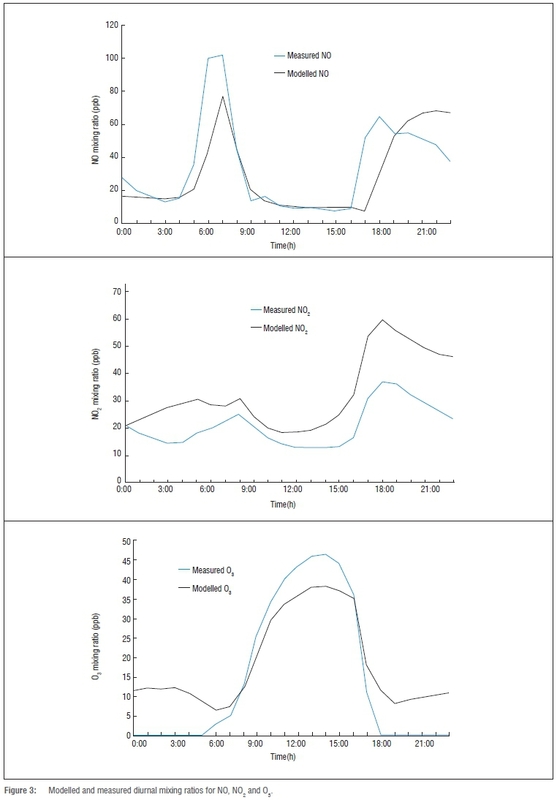 who derived averaged hourly emission factors (Figure 2) based on pollutant concentrations in various cities in Europe by utilising the chemistry transport model CHIMERE. As hourly values were needed for the photochemical box model used in this study, pollutant species were incorporated as hourly emissions in the model, based on the emission factors presented in Figure 2. Total atmospheric NO and NO2 concentrations are commonly measured together as NOx concentrations. For the model, however, it was required that the emissions of NO and NO2 species were separated. Various factors influence the NO/NO2 ratio from raw exhaust gas, e.g. petrol or diesel engines, or exhaust gas from diesel engines after processing by a catalytic converter.31 The NO2 fraction in NOx varies between 5% and 25% by mass, depending on the type of vehicle and fuel.31 The European Monitoring and Evaluation Programme (EMEP) of the European Environmental Agency (EAA) compiled an air pollution emission inventory guidebook (EMEP/EEA), which provides guidance on estimating emissions from both anthropogenic or natural emission sources.32 Based on the EMEP/EAA guidebook, it was assumed in the model that the NO/NO2 ratio for raw exhaust gas vehicle emissions was 80% NO and 20% mass fraction NO2. The Euro fuel specification is defined as the acceptable limits for exhaust emissions of new vehicles in Europe in order to meet their stringent emission regulations. The 'criteria' atmospheric pollutants are regulated through these standards. South Africa has also adopted this standard classification reference method. The different Euro specifications are an indication of when they came into force, i.e. Euro-0, pre-1993; Euro-1 in 1993; Euro-2 in 1996; Euro-3 in 2000, Euro-4 in 2005 and Euro-6 in 2014. According to Goyns29, the private passenger vehicle fleet in the Jhb-Pta megacity from 2001 to 2005 consisted of approximately 45% Euro-0 type petrol vehicles, 10% Euro-2 diesel vehicles, 30% Euro-2 petrol vehicles and 15% Euro-3 petrol vehicles. 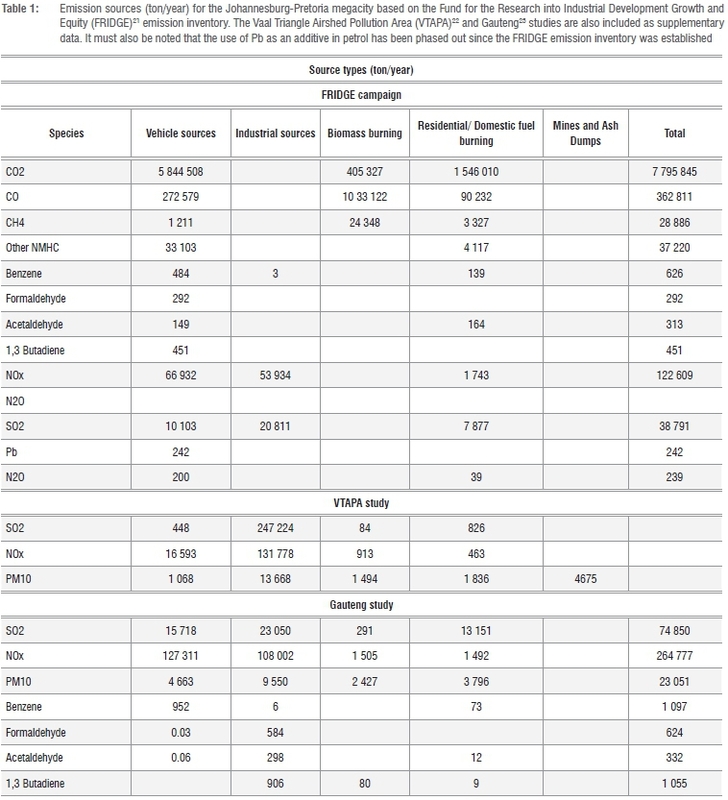 The percentages of each pollutant species emitted from the different Euro classified vehicles that was used in this study are listed in Table 3. As indicated in Table 3, Euro-0 petrol vehicles have the highest emissions and produce 40% CO2, 88% CO, 93% hydrocarbon (HC) and 82% NOx emissions, whereas Euro-3 petrol vehicles contribute much less, with 15% CO2, 2% CO, 0.5% HC and 0.4% NOx emissions. These derived emissions excluded heavy-duty vehicles and minibus taxis, which also contribute significantly to vehicular emissions in the Jhb-Pta megacity. In this study, the worst case scenario was assumed in the model base case run, i.e. that all vehicles in the Jhb-Pta megacity were Euro-0 type. During the sensitivity analysis, the impact of the conversion of all vehicles to Euro-3 type on pollutant species in the atmosphere was also investigated. The averaged initial mixing ratios of most of the criteria pollutants (NO, NO2, O3 and BTEX) were obtained from data collected at the stations indicated in Figure 1, from literature,15,33,34 as well as from data collected during a three-month (March-May 2010) monitoring campaign.3 These average initial mixing ratios are listed in Table 4. Measurements conducted at midnight (00:00) were used as the initial mixing ratio values in the MECCA-MCM-UPWIND model run, because the start time of the model is 00:00. No data were available for most of the species in the Jhb-Pta megacity as a function of height above ground level within the troposphere and therefore these mixing ratios were estimated, either through model simulations or obtained from literature. Estimated tropospheric mixing ratios for species were obtained from the global chemistry-climate model (EMAC).15 Output files from EMAC were generated for each day for all the major pollutant species (i.e. CO, CH4, PAN, NO, NO2, SO2) and used as input into the MECCA-MCM-UPWIND model. With the exception of CO and CH4, the other most important tropospheric organic trace gases are ethane (C2H6) and ethyne (C2H2).15,33 C2H6 is the second most abundant HC in the atmosphere and has a lifetime of approximately two months,35 whereas C2H2 has an estimated lifetime of 2-4 weeks in the atmosphere.36 No data were available for these species in the Jhb-Pta megacity, so the global mixing ratios in the southern hemisphere of 0.04 ppb and 0.044 ppb for C2H6 and C2H2, respectively, were used.32 The global mixing ratios for CO2, CO and CH4 were also used.37 Most vertical tropospheric O3 profiling studies in southern Africa have been conducted during sampling campaigns, e.g. SAFARI 2000. Vertical tropospheric O3 measured at Irene (Pretoria) was reported to be 60-65 ppb, between 2 km and 2.5 km above ground level.38,39 Concentrations of species such as O2, N2 and CO2 were fixed throughout the model runs. This study also includes a representation of advection of air masses from the highly polluted Mpumalanga Highveld into the Jhb-Pta megacity because of its proximity to the Jhb-Pta megacity. The composition of the air masses entering the Jhb-Pta megacity was simulated using MECCA-MCM-UPWIND making use of input data representative of the Mpumalanga Highveld. A total of 5 air quality monitoring stations within the Mpumalanga Highveld were used to obtain initial mixing ratios for this model run.3 The average wind speed used was 1.7 m/s as determined at four of these air quality monitoring stations. Model spin-up time of 24 h was performed in order to provide realistic initial concentrations for the second 24 h. The model results averaged over the second 24 h period were used as the upwind mixing ratio inputs for the Jhb-Pta megacity base-case and sensitivity runs. The same ML height utilised for the Jhb-Pta megacity was used for this model run, as the Mpumalanga Highveld is situated at approximately the same height above sea level. Recently Korhonen et al.40 also indicated that the ML over the Mpumalanga Highveld and Jhb-Pta are similar. Industrial activities are the main emission sources in the Mpumalanga Highveld. These industries mostly operate 24 h per day, so there is no diurnal variability in the emissions.41 Therefore it was not necessary to specify a temporal profile of emissions in the model run. Emission data for the Mpumalanga Highveld obtained from the FRIDGE study were utilised. The mixing ratios of all the pollutant species measured at the air quality monitoring stations in the Mpumalanga Highveld were used as initial mixing ratios for the Highveld model run. Average diurnal concentrations for the three months (March-May) were used. For this model run, the upwind mixing of species in the Mpumalanga Highveld was not included as the simulation focussed on the aging of air mass transported between the Mpumalanga Highveld and the Jhb-Pta megacity. Therefore, the upwind mixing ratio of the species within the Mpumalanga Highveld was the same as the initial mixing ratios for all the simulations. The result from this Mpumalanga Highveld model run, which was used as input for the Jhb-Pta megacity, are summarised in Table 4. A base case model run using the input data, as previously discussed, was used to compare predicted pollutant mixing ratios to measured mixing ratios obtained during the sample campaign. The averaged wind speed of 1.7 m/s based on the metrological data was used in the Jhb-Pta model runs. Figure 3 presents the comparison between the measured and modelled results for NO, NO2 and O3 mixing ratios. The modelled diurnal NO pattern was in general in good agreement with the measured NO. The diurnal variation in the modelled NO can be attributed to changes in emissions, transport, chemistry and the ML height in the box defined for the model. The peak of NO in the morning and evening was well reproduced by MECCA-MCM-UPWIND. This increased NO mixing ratio can be ascribed to increased emissions within the model. The measured data also showed the same tendency with NO usually peaking in the morning because of increases in emissions from vehicles and household combustion, in conjunction with a relatively low boundary layer height. 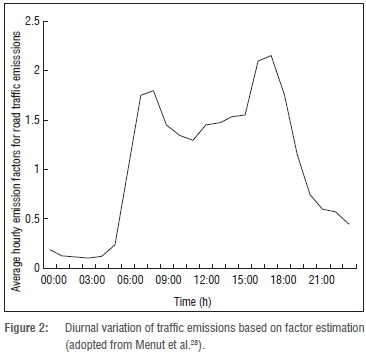 The early morning peak between 6:00 and 9:00 coincided with the time that commuters travel to work.3 The second peak observed between 16:00 and 21:00 for both the measured and modelled data can be attributed to traffic emissions and household combustion (space heating and cooking).43 A decrease in NO emissions was observed for the measured data after 19:00. This is the result of a significant decrease in NO sources. However, the model results indicated an increase in NO mixing ratios. This can be explained by emission and ML effects in the model. When the ML decreases within the model, it stops the vertical mixing from above the ML, which results in the accumulation of NO because of the decrease in volume and emissions emitted into the model. It seems that the modelled NO2 mixing ratios were somewhat over-predicted by MECCA-MCM-UPWIND, although it was in relatively good agreement with the diurnal variability determined with the measured NO2 concentrations. Because 20% of NOx emitted from vehicles are NO2, diurnal changes of traffic emissions will also influence the trend observed. The first NO2 peak can be explained by the increased traffic emissions resulting in higher NO2 mixing ratios and decrease as the ML height increases, which results in NO and NO2 mixing ratios decreasing, which implies that less NO is available to chemically transform to NO2. This leads to a decrease in NO2 mixing ratios. The second observed peak later in the day can be related to the slowed photolysis rate of NO2, resulting in the accumulation of NO2. The diurnal cycle of O3 was well predicted by MECCA-MCM-UPWIND and is in good agreement with measured concentrations, although some differences between the measured and modelled data were observed. MECCA-MCM-UPWIND simulated very low mixing ratios of O3 during the early morning hours and evening hours with a slight over-prediction during the daytime mixing ratio of O3. O3 is accumulated through photochemical oxidation processes throughout the day until dusk. At this time, the photochemical processes slow down because of to the lower levels of solar radiation. The ML height decrease also results in no entrainment from above. The almost zero O3 levels during night-time for the model run can be attributed to the NOx-titration effect within the model. Model results presented later in the paper (Figure 5) indicate that there is enough NO in the model to completely convert all the O3 to NO2. NOx titration can drive O3 concentrations in urban areas to less than 1 ppb.44 The discrepancy between the measured and modelled results can be considered as a possible limitation of the model. However, other modelling studies, e.g. Stockwell et al.45, have emphasised the difficulty of correctly representing night-time chemistry in models. In this model run, the sensitivity of the Jhb-Pta megacity to the rate at which external pollution is advected into the megacity was examined. 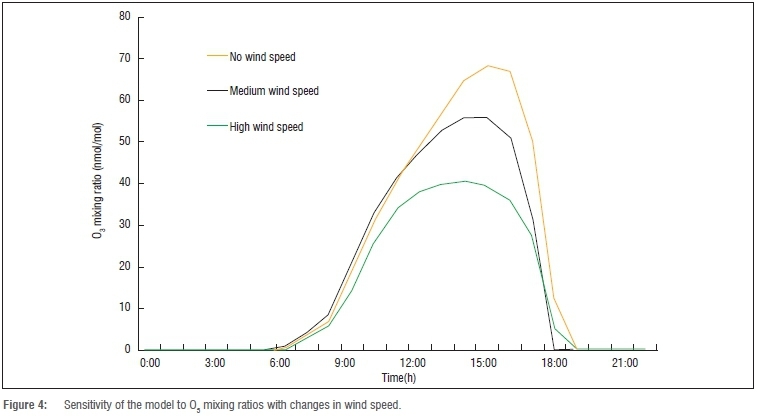 Although O3 concentrations in the atmosphere are influenced by changes in meteorological conditions, such as ML height, temperature and wind speed, in this scenario only wind speed was varied. The influence of no wind (0 m/s), medium wind speed (1.7 m/s) and high wind speed (3.4 m/s) from the Mpumalanga Highveld was calculated with the MECCA-MCM-UPWIND model. The results presented in Figure 4 indicate that lower wind speeds lead to increases in O3 mixing ratios in the Jhb-Pta megacity. The results show that wind speed plays an important role in the processes that control O3 concentrations in the atmosphere. According to the model, O3 levels are 12 ppb higher when there is no wind present compared to medium wind speed, while O3 mixing ratios are 22 ppb lower during medium wind speed conditions compared to higher wind speeds. When the upwind air mass enters the Jhb-Pta megacity, it is instantaneously mixed in the model with the air in the Jhb-Pta megacity. This implies that if the wind speed doubles and other conditions remain equal, more NOx is transported from the Mpumalanga Highveld into the model, which can lead to the titration of O3 within the Jhb-Pta megacity as is evident from Figure 5. Lower wind speeds implicate longer reaction times, assuming all other conditions stay the same. Additionally, O3 is a secondary pollutant whose concentration will increase with time as the precursor species react. It is evident from Figure 5 that NO levels increase at higher wind speeds from the Mpumalanga Highveld. The same effect was observed for O3. When a lower concentration of O3 is advected into the Jhb-Pta megacity at twice the rate, the concentrations of O3 within the Jhb-Pta megacity will decrease. Increasing the O3-titration effect results in decreased O3 levels in the Jhb-Pta megacity. In stagnant conditions where no upwind air is advected into the Jhb-Pta megacity, the concentration of the pollutants in the Jhb-Pta megacity is only influenced by the initial concentrations, emission levels, vertical mixing and chemistry within the megacity. Under these conditions, the local emissions and vertical mixing tend to contribute significantly to the photochemistry for the formation of O3. In order to calculate the effect of emissions of VOCs and NOx in the Jhb-Pta megacity on the photochemical production of O3 occurring within the megacity, six case studies were conducted. These case studies were conducted for the reduction and increase in VOC and NOx concentrations separately, as well as in conjunction with each other. In order to avoid potential nonlinearities associated with changing the chemical regime (e.g. 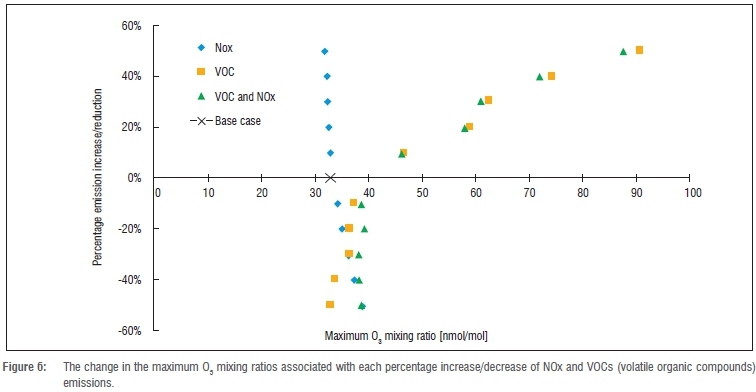 NOx-limited or VOC-limited), increments of 10-50% were used. The maximum O3 mixing ratio resulting from the percentage change for each case study was plotted (Figure 6). The O3 base case concentration is indicated by the black cross at 56 ppb. The relationship between NOx and VOC concentrations for the production of O3 can be illustrated by means of isopleth plots.46 On these isopleth plots, certain chemical regimes can be identified, i.e. areas where O3 formation depends either on NOx or VOC concentrations. The results obtained from the incremental changes in Figure 6 can be related to these O3 isopleth plots. An increase in O3 production is observed when VOC emissions are increased, while O3 levels decrease when NOx emissions are increased. Reducing NOx emissions while keeping VOC emissions constant will therefore result in an increase in O3 concentrations. The changes of O3 mixing ratios resulting from the increase in NOx emissions are lower than the increase of O3 levels observed when NOx emissions are reduced. The changes observed with the model can be related to the isopleths in the VOC-sensitive regime. Chemically, this observation can be explained by the reaction of the HO• radical with NO2 producing HNO3 that is dominant at high concentrations of NOx and suppresses the concentration of the HO• radical. The production of HO2• and RO2• radicals, which are produced by the oxidation of VOCs with HO• radicals, is slowed down and results in less O3 production. Regarding the O3 isopleths, the results shown in Figure 6 indicate that the Jhb-Pta megacity is a VOC-limited (or NOx-saturated) regime. Therefore, according to the model, O3 production in the Jhb-Pta megacity will be reduced most significantly when the VOC emissions in Jhb-Pta megacity are reduced. 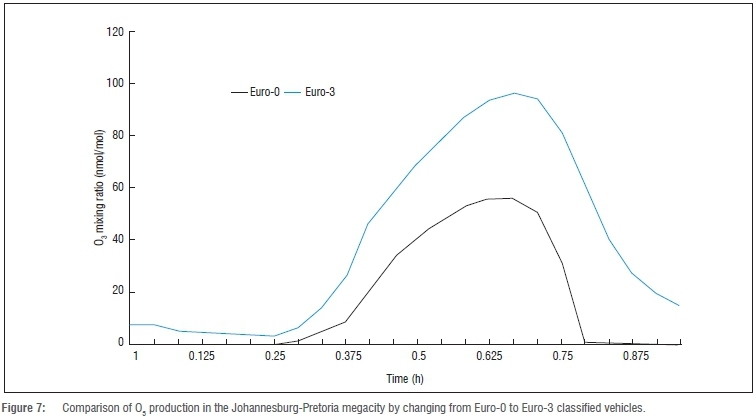 The fuel strategy of the South African government is to only have vehicles on the roads classified as Euro-4 and higher emissions standards in the future.47 Therefore, in this case study, the effect of reducing vehicular emissions in the Jhb-Pta megacity on the production of O3 was also investigated. Based on the values of emissions associated with each Euro-classified vehicle listed in Table 3, a model sensitivity run was performed in which emissions of VOCs, NOx and CO were reduced from Euro-0 to Euro-3 vehicles. The results are presented in Figure 7. As is evident, a significant increase in O3 production of approximately 23 ppb is observed. This is consistent with other modelled sensitivity studies of traffic emissions that also predict that future urban O3 concentrations will increase in many cities by 2050 because of the reduction in NOx titration of O3, despite the implementation of O3 control regulations.48 The increase of O3 is also consistent with the NOx saturated regime as indicated in Figure 6, which indicated that VOCs should be reduced concurrently with NOx in order to avoid the increase in O3 levels. Compared to measured data, MECCA-MCM-UPWIND was able to predict the diurnal variability of NO, NO2 and O3 within the Jhb-Pta megacity relatively well. Daytime chemistry was especially well simulated, while small under-predictions were calculated for night-time chemistry. Some of the uncertainties in the model can possibly be attributed to the emission inventories utilised and the deficiency of well-defined NMHC data for the Jhb-Pta megacity. 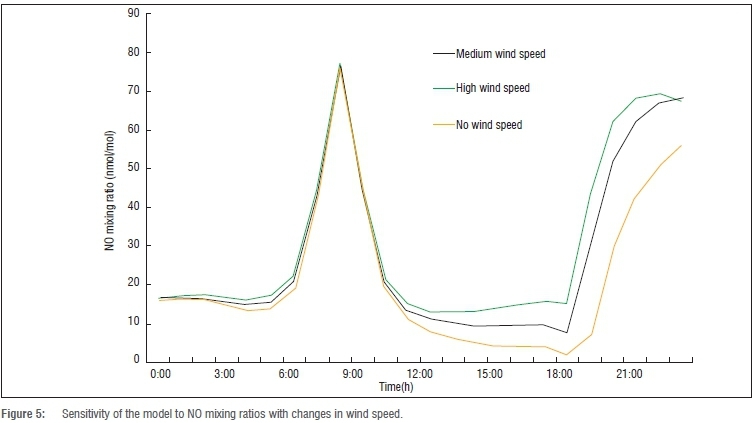 Sensitivity analyses showed that O3 mixing ratios decreased with increasing wind speed and increased with decreasing wind speed within the Jhb-Pta megacity. This indicated that the Mpumalanga Highveld could potentially be a major source of NOx in the Jhb-Pta megacity. This implies that if the air quality for the larger surrounding area improves, the concentration of the secondary pollutant O3 will increase in the Jhb-Pta megacity. The influence of NOx and VOC concentrations on O3 formation in the Jhb-Pta megacity indicated that the Jhb-Pta megacity is a VOC-limited (or NOx-saturated) regime. Therefore, O3 levels in the Jhb-Pta megacity will be more effectively reduced if VOC emissions decrease. A reduction of NOx emissions will lead to an increase in O3 because of a decrease in titration through the reaction with NO. The same effect was observed in various cities worldwide where O3 levels increased when NOx emissions were reduced during emission control strategies. The increase of O3 can be avoided if VOCs are also reduced. The limitation associated with comparison of the modelled data with a three month measured data set was realised. It is recommended in future that modelled data be compared to a complete 1-year ground measurement data set, which will account for different meteorological conditions occurring in each of the seasons. Future work should also aim at improving the model to reduce over- and under-prediction of concentrations of species. Expanded and accurate emission inventories for South Africa will be pivotal in improving modelled data sets. It is also important that changes in the vehicular fleet should be reflected in improved emission inventories. The authors acknowledge Sasol Research & Development and the National Research Foundation for their financial support. A.S.M.L., T.M.B., J.P.B. and P.G.v.Z. were the main investigators in this study. A.S.M.L., T.M.B., J.PB. and PG.v.Z. were project leaders of the study and wrote the manuscript. A.S.M.L. conducted this study as part of her PhD and performed most of the experimental work. PG.v.Z. and J.PB. were also study leaders of this PhD study, while T.M.B. was an assistant study leader. G.D.F. and M.G.L. made conceptual and logistical contributions.